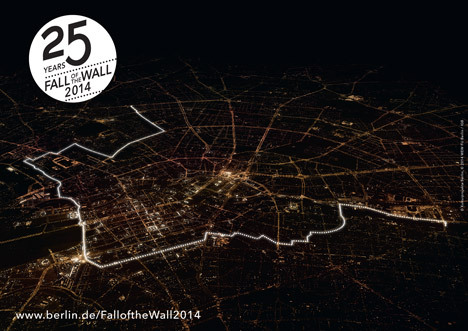 The German capital is commemorating 25 years since the fall of the Berlin Wall with a trail of illuminated balloons along its former route (+ movie). 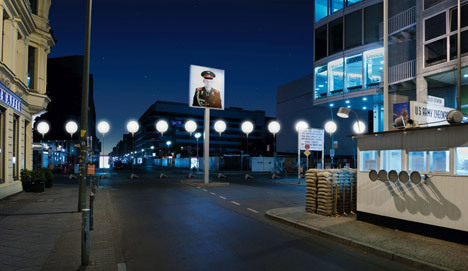 The Lichtgrenze, or “border of light”, installation by interaction designers Whitevoid and film studio Bauderfilm will follow the path once occupied by the Berlin Wall, which separated West and East Berlin for 25 years until 1989. 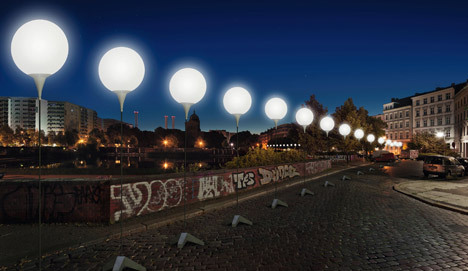 Spherical lights will be raised on slender stands to reach the height of the infamous wall, first erected in 1961 by the socialist German Democratic Republic (GDR). 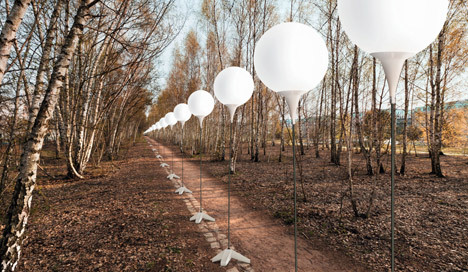 The line of balloons will trace a 15-kilometre stretch of the 140-kilometre-long structure that circled the western half of the city, cutting it off from its land connections with GDR-controlled East Germany. 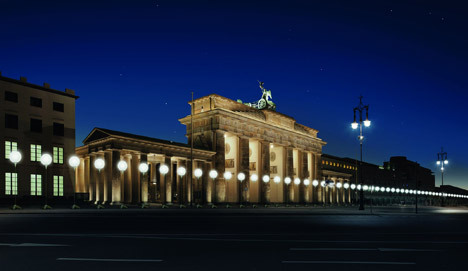 Lichtgrenze is to pass famous Berlin landmarks including the Brandenburg Gate, the Reichstag parliament building, Potsdamer Platz and Checkpoint Charlie – one of a series of former transition points between the two sides of the structure. Viewing towers, information points and guided tours will feature at locations including Mauerpark, the Berlin Wall Memorial at Bernauer Strasse and East Side Gallery. Large screens will show unique film collages that document the wall’s history. The Berlin Wall was built to prevent mass emigration from the Eastern Bloc to the West in the period after the Second World War. Following a series of large-scale protests and subsequent political changes, the wall was breached by East Berlin residents on 9 November 1989 before being largely destroyed the following year. 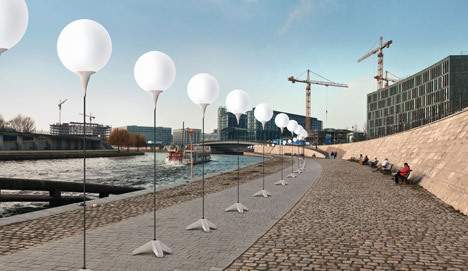 To symbolise this event, the balloons will be illuminated on 7 November and released into the air on the evening of the ninth. The installation is part of a series of art commissions and social events organised to coincide with the date that the city was physically reunited, signifying the collapse of the communist Eastern Bloc. “The events of 25 Years Fall of the Wall remind us of a historic event in our city that radically changed the course of world history,” said a statement issued by the city.